If you love high quality desert golfing environments, and are willing to make the 1/2 hour drive from the strip, Boulder Creek Golf Club in Boulder City is a no-brainer. 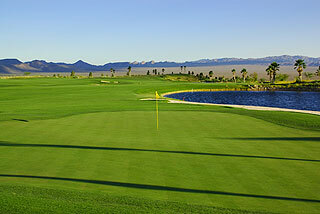 At $120-$130 including cart in 2004 during prime season, this experience is one of the best values in the Vegas Valley. Twenty seven gorgeous golf holes were masterfully designed by Mark Rathert, with six set of tee boxes leading to generous fairways and player friendly green complexes - featuring wonderful conditioning from tee to green. 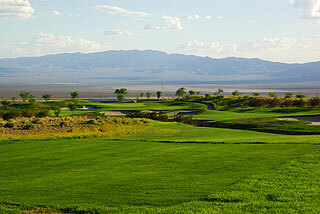 The views of the surrounding mountains natural desert are as beautiful as you will find - and are quite reminiscent of the vistas found on the great courses at Primm Valley. The rolling terrain winds over and around desert arroyos and waste areas, creating the need for good course management, while the wide landing areas in the fairways and greenside make the layout playable for all levels of players. 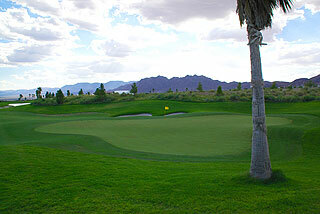 The Desert Hawk and Coyote Run nines were opened for play in January 2003, and constitute the main 18 hole layout on property. The six sets of tee boxes here provide a great deal of variety to choose from, with the black tees measuring a whopping 7628 yards with the 142 slope rating. The remaining sets play to: golds - 7072/130 slope, blues - 6568/120 slope, whites 6080/117 slope and reds 5626/124 slope for ladies. The additional green sets are developmental tees playing to 4984 with a 117 slope rating. The facilities at Boulder Creek are top notch beginning with a beautifully designed clubhouse, complete with a pro shop, changing rooms with lockers, and a spacious and elegantly designed restaurant/lounge - featuring breakfast, lunch and dinner (no dinners on Sunday and Monday) daily. Large groups for outings and special events can be accommodated quite comfortably in an adjacent pavilion. The practice facilities include a huge range with mats and natural turf hitting stations, a short game area with practice bunkers, and two large putting greens. On course golfers will find carts with ball and club washers, and the Uplink GPS providing accurate information from the tee to the pin. Sprinkler heads are also measured to the center of the green. A helpful yardage guide booklet is available in the pro shop, and is highly recommended. 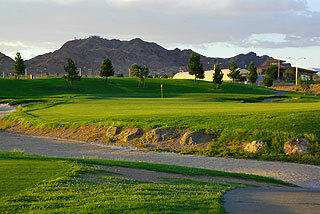 A key to scoring well here is to properly navigate the many arroyos and desert waste areas. With plenty of room near the greens and on the ample fairways, we would have to definitely label this course player-friendly. Mid handicappers and average golfers will have to choose between the blue and white tees - with this helpful hint. If the wind is up - the 6500 yard blue tees will play even longer. With a gentle breeze (which are often encountered on early morning rounds) the blues are very reasonable. Long hitters may attempt to carry the edge of the fairway bunker on the opening hole, while others will have to drive one between the trap and the palm trees resting in the center of the fairway. Played to the right side - this becomes a very long hole. The right center is best on two. There is a desert wash all along the left side and the fairway narrows 200 yards in, making this a three shot par five for most golfers. The green complex is protected by a huge bunker short right. Another large sand trap fronts the back to front sloped green on the par four 3rd. 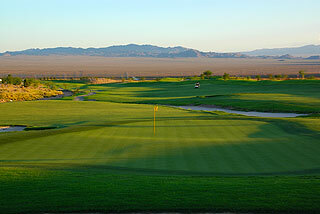 There is plenty of fairway, but stray too far left and the desert waste area comes into play. There is plenty of room near the green on the par three 4th, which plays 1 club uphill over an arroyo. This precedes a score-able par five with another arroyo about 210 yards out, which will warrant your attention off the tee and on the approach. A sand waste area fronts the green, but there is room to miss right, for those attempting to reach in two. Water comes into play on the right and desert to the left makes number six of the more challenging par fours of the day. If approached from the left side, this green is more accessible. The tee shot on 7 is played from a blind tee area - to a split fairway. From all tees except the forwards, the tee shot should be played to the fairway on the right, which has a great deal of room. If you pick up a yardage/diagram booklet in the pro shop prior to your round - you will get a good picture of what you are dealing with here. Pay attention to the pin placement, as a ridge runs through the front of the putting surface. The tee shot on the par three 8th must carry a grass valley, and land below the pin on this green that slopes back to front and right to left. 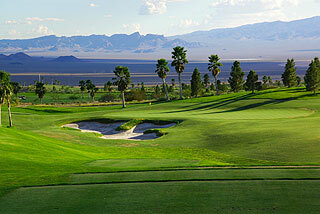 The finishing hole on the Desert Hawk invites a tee shot placed between the fairway bunkers. Long hitters might consider hitting over the pond to the right of the fairway trap. Be aware that a creek crosses the fairway about 50 yards out. Hole # 1 on Coyote Run presents a fairway that slopes left to right, with a tee shot aimed over the center fairway trap the recommended play. The green is elevated and slopes left to right. Number two is accentuated with a minefield of fairway and greenside bunkers. A shot carrying the right edge of the center trap will leave the most advantageous positioning from which to approach the back to front sloped green. The par three 3rd is nearly all carry over desert, with ample bail out room short left, and is followed by a long par five that doglegs left over a desert wash. This arroyo winds around and also cuts through the fairway about 70 yards away from the elevated putting complex.The ample fairway on five plays uphill over desert wash that also runs the length of the hole on the left. The mountain backdrop here is gorgeous. Number six is very open off the tee, but an arroyo crosses about 100 yards out. Lay up to this marker and the approach is simple. 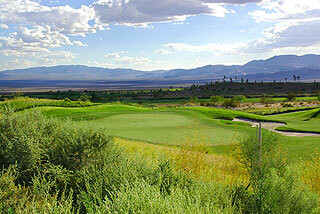 The seventh is an enormous golf hole, playing to 635 yards from the tips. There is plenty of fairway , with bunkers lining each side. Golfers will have to choose between going over the arroyo on the second shot (comes into play about 240 out on the right side), or laying up to the 115 yard area for a safer approach. Number eight is a beautiful par three over a pond, with ample bail out room on the right and precedes a very challenging par four. This closing hole begins with a split fairway off the tee. From our vantage point, it did not seem that cutting a bit of distance off by playing to the left fairway was worth the risk, as one pond sits short left and another is waiting for shots hit too far. Pay attention to the yardage guide - as the fairway bunkers on the right are very reachable - creating the need for an accurate lay up. 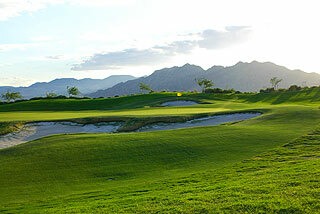 The approach is downhill to a beautiful green that is well protected by sand traps on either side and water to the left. The Eldorado nine is the most recent to open at Boulder Creek - and during our visit was used only on the busiest of days, affording the course more opportunity to grow in...We had the opportunity to play it and were very satisfied with the conditioning for such a new course. The layout is similar in nature to the original 18, but the landscape was rich with spectacular desert wildflowers and natural growth. Check out the photos below. A nearby air strip specializes in parachuting, and during our round we had the opportunity to see quite a few groups as they floated to earth near the golf course. 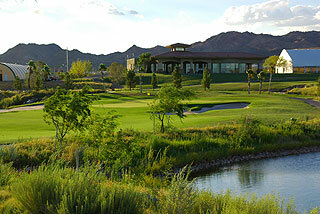 Two Guys Who Golf highly recommends a round - or a day at Boulder Creek. We think you will thank us for this tip - which we are proud to offer. 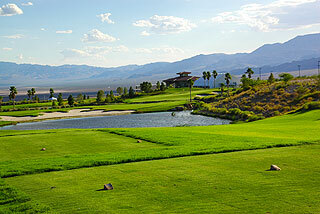 This is a gorgeous golf facility, and easily accessible just off the highway driving in from Las Vegas or Laughlin. It is WELL WORTH THE TRIP! For more info call the course, or visit our informational page for Boulder Creek - with a link to their web site, by clicking here.